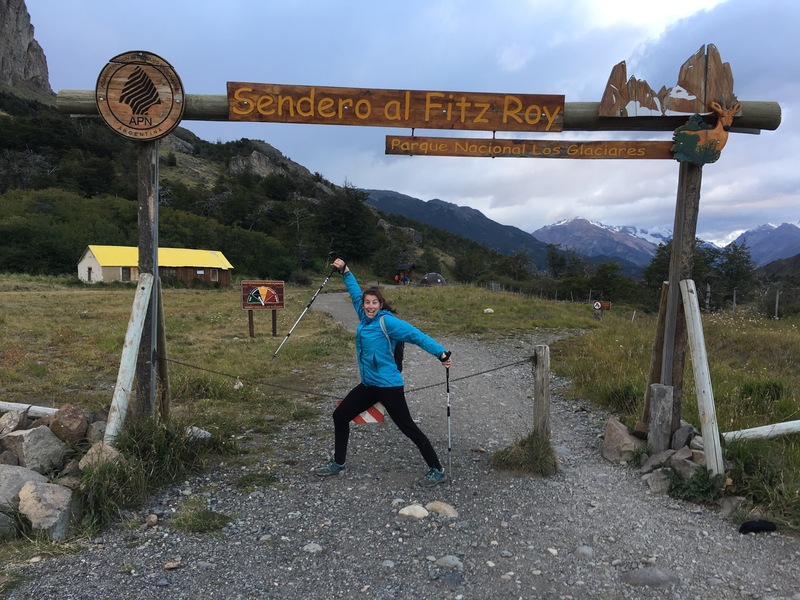 El Chalten & Trekking Our Hearts Out in Southern Patagonia – jd – To Infinity & Beyond! El Chalten is a small village in the middle of nowhere in southern Patagonia within the boundaries of the northern part of Glacier National Park. It has a permanent population of only 1,600 residents (though the number close to doubles during high tourist season). The closest connection to El Chalten is El Calafate, which is a 3 hour bus ride away (on paved roads! ); the drive itself is a tourist attraction. 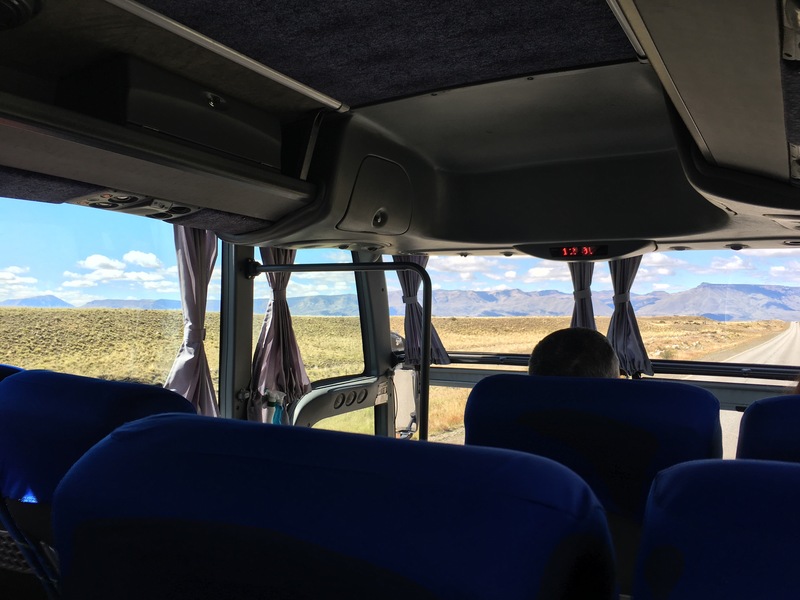 From the bus, you could see forever across a seeming sort of a wasteland of dry scrub; but there are a few huge (like so big you can’t see across them) turquoise lakes and imposing distant mountain peaks. On top of that, you get animals like guanacos (a cousin of the llama) and rheas (cousin of the emu/ostrich). Mixed in are some sheep, horses, and cows. While I wanted to sleep on the bus ride, I couldn’t because I was so mesmerized by the scenery. A mesmerizing bus ride of lakes and animals! The scenery was so mesmerizing that I managed to leave my phone on the bus, which I realized while in the bus station. I left David to rummage through my bag and ran back to our bus, just in time to see it pulling out of the station. You bet I ran as fast as I could, flagged the bus down, and said “Pienso que mi telefono esta en el bus!”. Luckily this story has a happy ending – I found my phone on my seat, shouted “Gracias a dios!” and ran off the bus. Now I triple check that I always have my phone. 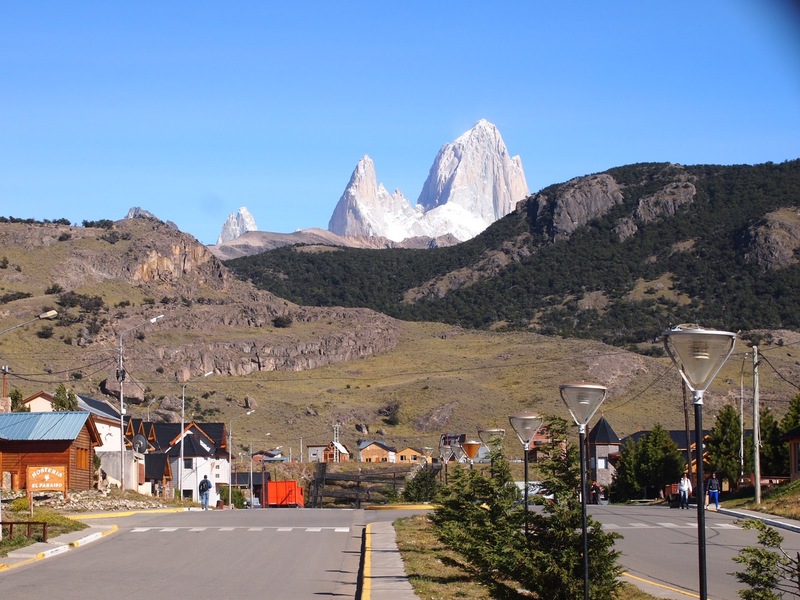 Back to El Chalten: From town, there are 3 main (day) hikes that are the draw for most people to El Chalten (though there is also an array of camping, climbing, and mountaineering to be had). 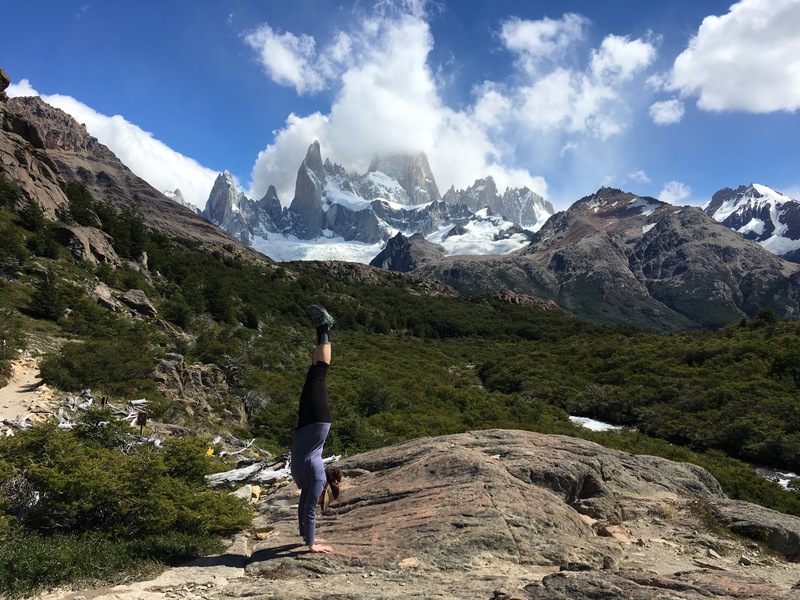 These hikes are all centered around the peaks of Cerro Fitz Roy and Cerro Torre and involve gorgeous glacial lakes. The peaks have snow on them year round and none of the hikes are to the summits – they are to views of the summits. Loma del Pliegue Tumbado– This hike starts at the ranger station and gives you amazing views for the duration of the hike. 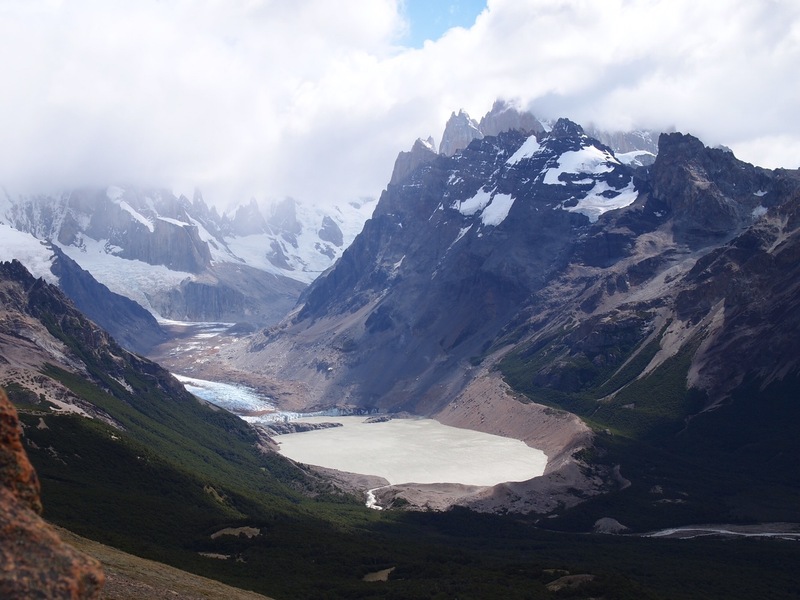 It is the only hike that will give you a view of both Torre & Fitz Roy (if you are lucky – so many clouds!). The hike is about 12 easy miles total and you finish with a far away view of the peaks, a lake, and a glacier. Gradual elevation, took about 6.5 hours. 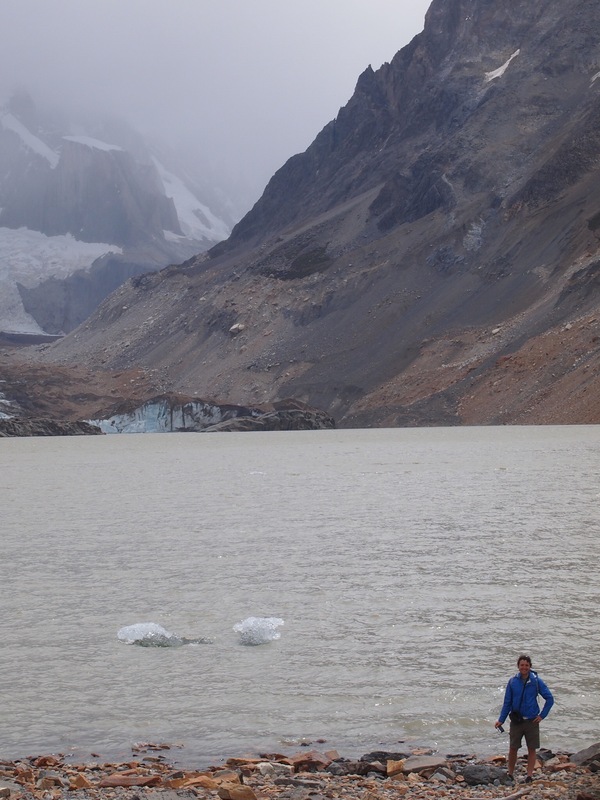 Laguna Torre – This hike finishes at a glaciar/glacial lake (where we picked up glacier chunks) and where you could see Torre (we never did – clouds). It’s just over 11 miles total. The elevation was also pretty gradual and it took a little under 8 hours. 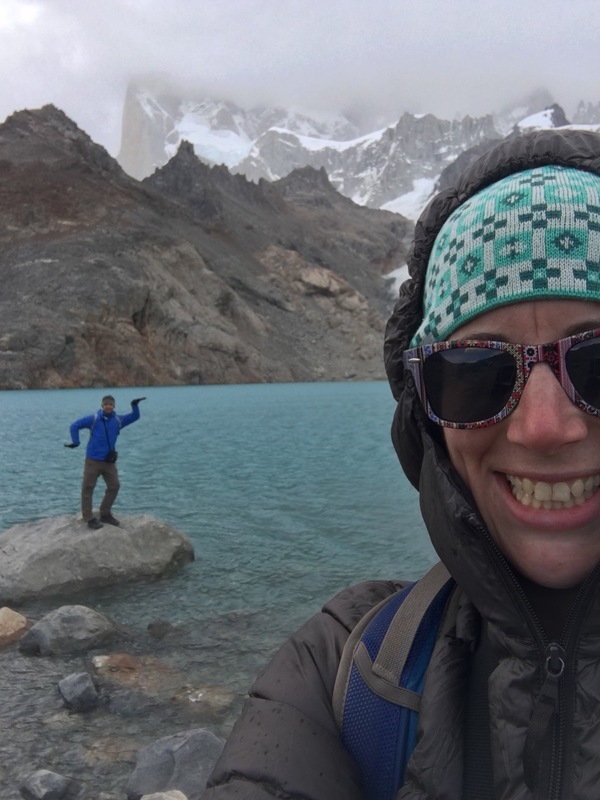 Laguna de Los Tres – This hike gives you amazing views of Fitz Roy. It is tough – stiff elevation for the first 2-3km, then flat for about 6km, then the last kilometer is about an hour straight up. It’s 12.5 miles total and 8-9 hours, but totally worth it. We did all 3 of the major hikes on an every-other day schedule because we were completely exhausted and wasted after each one, having walked usually 9 hours per day. Literally, our feet themselves hurt like they have never hurt before. Each night we would sit opposite of each other and rub and massage each other’s feet/legs (thank you marriage!). According to my Apple health app (which is not totally accurate), we walked 15.2, 16.5, and 19.6 miles on each of those days. And our bodies felt every bit of it. For the week overall, we walked close to 65 miles, which I didn’t imagine I could do! On our “days off”, we hiked 6 miles round trip to a waterfall and biked 16 miles. We’re not good at resting. The town itself is cute and quaint. The internet is accessed via satellite and was down in half the town while we were there (and painfully slow where it did work). Being there 6 days, we covered the whole town several times over. We ended up going to the same restaurant (Ahonikenk) for dinner 3 times because we so enjoyed the food and atmosphere. It was filled every night with a good mix of locals and tourists. We enjoyed lamb stew, lentil stew, spaghetti, lamb ravioli in a butter and walnut sauce and each time we got a “pinguino” – a penguin shaped vase of house wine! With the town being so small, we often would see the same people all week – on the street, at restaurants, and on the trail. Despite the town and amazing views, they first thing that comes to mind when I think of El Chalten is “muy ventoso!” – very windy!!! The town is incredibly windy, as are the exposed parts of the hikes. There are almost always nubes (clouds) hugging and obscuring the views of the peaks. In our 6 days there, there were only 2 days when you could actually fully see the tops of Torre & Fitz Roy (and of course neither of those were days we were hiking). Trekking poles saved my knees and marriage. Use trekking poles. They will make you so much happier and so much faster. All places only take cash and there’s only one ATM in town that frequently runs out of money. Bring plenty of “effectivo” (cash) with you. The grocery stores were a joke. Take a lot of empanadas hiking with you and bring more food than you think you’ll need. You can drink glacier water while hiking. We hadn’t planned to go to El Chalten, but added it to our itinerary when getting to Torres del Paine, the flagship, amazing national park in Chile, seemed too complicated. And we’re sure glad we did!